Goodreads will give me suggestions of other books to read and reviews that other members have posted. Sometimes that’s good, sometimes, not so good. I wouldn’t suggest doing what I did once, which was to look at other people’s reviews when I was in the midst of reading The Lovely Bones. I read a really negative review which upset me. The reviews are helpful if you have no idea what a book might be about. I also like the idea that after a while you get to know the book tastes of your friends. If they like a book, I should like it, if they didn’t…take it off the list! I’m going on and on here because each year Goodreads has a reading challenge and this year I decided to join. At first, I wasn’t getting carried away with myself and I set a goal of 25 books. I figured I could handle two per month. I reached that goal in April sometime. I didn’t change my goal but kept reading. I reached 50 somewhere in July and decided I should change my goal. Then I just kept going. I realized about 3 weeks ago that I had hit 70 books and figured I should raise my goal. I raised it to 75. Today, I reached that goal! I’m fairly impressed with myself. During this reading frenzy, and I have to be honest…that’s almost what it felt like, I’ve read a wide variety. Thanks to my friend, Kristen, I’ve gotten into Young Adult fiction. I’ve read two series-The Hunger Games and Uglies and I’ve started on a third-the Divergent series. I almost forgot The Giver Quartet…a real gift. I’ve read a number of books by old favorites like Alice Hoffman and Anne Tyler and made some new favorites, Lisa Scottoline and especially Carlos Ruiz Zafon. There are just so many different and intriguing authors to choose from. The funny thing is that most of these books have come by way of thrift stores or Goodwill or library book sales. The series books were borrowed from the Kristen Lending Library and quite a few from the local library. I suppose the next logical challenge would be 100. I have a month and a half yet until the end of the year. I never thought I could get to 75, but there really isn’t time for me to get to 100. I might make it to 80, but I’m not going to ask too much of myself. I’m now trying something new. 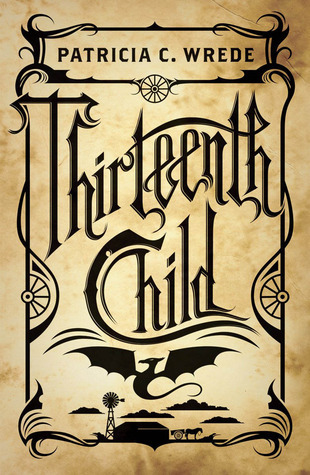 Thirteen Child by Patricia C. Wrede. I’ve seen it described as steampunk in the Wild, Wild West with magic and dragons thrown in for good measure. I’ve only just started it so we’ll see how it goes. If I like it, there are two more books to look forward to. I got this from the library and I’ve already checked that they have the other two. Looks like fun so far. I guess I should give myself a pat on the back. For me, 75 books in one year is quite an accomplishment, one I never would have thought I’d complete. I’m not sure I would have done it if it weren’t for the Goodreads Challenge. I’m glad I participated and I have a new plan for 2013. I’ll share that as we get closer to the New Year. It should be fun! Mom would be very proud of you! 75!!!?! fran, that is AWESOME!!! and thanks for sharing more about how goodreads works…i am not that familiar with the site (a goal for 2013 for me would be to join?!). i am going to say you can hit 85 for 2012! happy reading…hope you get time to get well into the “thirteenth child” today! Thanks, Cathy! I think you would enjoy Goodreads! It’s fun and it’s very useful for finding new books…like I actually need to DO that!!! 😉 85…hmmm…maybe I can do it! Have a great Friday! Funny, Stacie! Yes, “3” has something to do with it! I’m not really sure myself. I guess they both mean enough to me that I make it work. Of course I don’t have little ones to take care of, either, or quite as big a house! Thanks, Dana! I really don’t know how it happened. I just kept plugging along! You’ll get back to it next year. Life won’t stand in your way forever! Enjoy your weekend!